A service flag or service banner is an official banner that family members of servicemen and servicewomen of the United States in harm's way can display. The flag is comprised of a white field with a red border. Each blue star represents a family member in active duty. A gold star represents a family member that died during service. The deceased may have died in action or due to unrelated causes. These flags were first used in World War I, and had been standardized by the end of World War II. 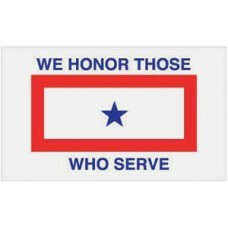 It is also popular for companies or organizations to fly a service flag if one of its members is serving active duty.